Having dared to dream of a win for the ages, the red-and-white masses who thronged Wembley were confronted by cold, hard reality at around quarter to three on a thrilling Cup final afternoon. Its arrival had been delayed, held up by the brilliance and bite of Gus Poyet’s expertly executed gameplan, which squeezed the life out of Manchester City’s expensively assembled aristocrats for 45 mesmerising minutes. Fabio Borini’s rapier drive had sent adrenaline surging through Wearside veins – only for Yaya Toure and Samir Nasri to extinguish the burning desire of Poyet’s Black Cats. Sunderland could not respond and yet the emotion this morning among red-and-white dreamers should not be too downcast. It will be raw and it will hurt deeply this morning, but when we sift through the wreckage of their dashed Cup dream there should be enough to suggest that these kind of days can become more than once-in-a-generation events. This is a club that has been transformed by this incredible run, and the challenge now is to make sure that feeling of optimism can be sustained with no tangible set-piece final to focus on. They must start with securing the future of the manager who will again have impressed the wider footballing world with his tactical ingenuity and classy reaction to defeat. Then they must make sure that the values that Poyet has instilled in this team – daring to attack, diligence in their defensive work and sticking to their principles even when the momentum is against them – are continued. They went out on their shield at Wembley: deservedly beaten by the better team but having left nothing behind. Considering how the finals of 1992 and 1985 ended, that was important. There was no successor to David Corner yesterday; no hollow feeling of having failed to turn up. Sunderland dared to dream and there should be no disgrace in falling short when the margins are as fine as this. Had Borini checked inside when freed in the first half rather than allowing Vincent Kompany the chance to execute the most precise of sliding challenges, Sunderland might have been able to withstand the rise of the blue moon in the second half. Similarly, if Steven Fletcher had retained the sharpness that persuaded Ellis Short to write Wolverhampton Wanderers such a large cheque last summer, Sunderland might at least have bought themselves an extra 30 minutes to dust themselves off and go again. As it was, they were left with the consolation of Poyet’s pride and encouraging signs for their battle on two fronts: to win the FA Cup and salvage their Premier League status. Asked his reaction to Fletcher’s miss, Poyet sighed before uttering one word: “Moments”. Sunderland had plenty of those during the first half as they tore into City with the sort of tigerish display that summed up the pent-up desire of the massed hordes in the east side of Wembley. Poyet had waited until the metaphorical last minute before instructing the Sunderland team bus to wind its way out of their Hertfordshire hotel towards Wembley Way. He wanted his players to see the Black Cats fans, to feel and taste how much it meant to supporters who had not witnessed their team in a major final for 22 years. Short of leading them out for a pint in Covent Garden on Saturday night, it was a brilliant ploy that brought the best out of players who had looked so cowed at the Emirates just seven days before. Motivation is one thing but arranging them in a system that might bring the best of them was Poyet’s masterstroke. Jack Colback was shunted to the left of midfield: his growing footballing maturity reflected by Poyet’s decision to hand him the job of handling Pablo Zabaleta. One man’s misfortune was another’s opportunity, and within 10 minutes Borini had justified Poyet’s faith. It was a move that tied together all of the strands of Poyet’s approach: Lee Cattermole having wrestled possession for Sunderland to allow Adam Johnson to play a peach of a through ball to the Italian. On the gallop, he still had work to do. Thoroughbred Kompany stumbled, Borini pounced on his misjudgement and then angled a stirring drive past Manchester City goalkeeper Costel Pantilimon. It was joy unconfined among the Wearside support, who bounced Wembley to its very foundations with their elated response. They might have had more. For half an hour they looked dangerous at every turn, unsettling Manchester City with their pressing and prompting. Cattermole delivered a complete performance, angling wonderful passes while harrying and harrassing City’s unsettled players. Belief built. When the half-time whistle sounded, Sunderland fans around the press box rubbed their eyes in disbelief. The mirage was to be exploded in a second-half minute that emphasised the power and precision of their heavyweight opponents. Toure’s goal was superlative; Nasri’s second – courtesy of a ball knocked into his path inadvertently by an injured Larsson – was rapier. 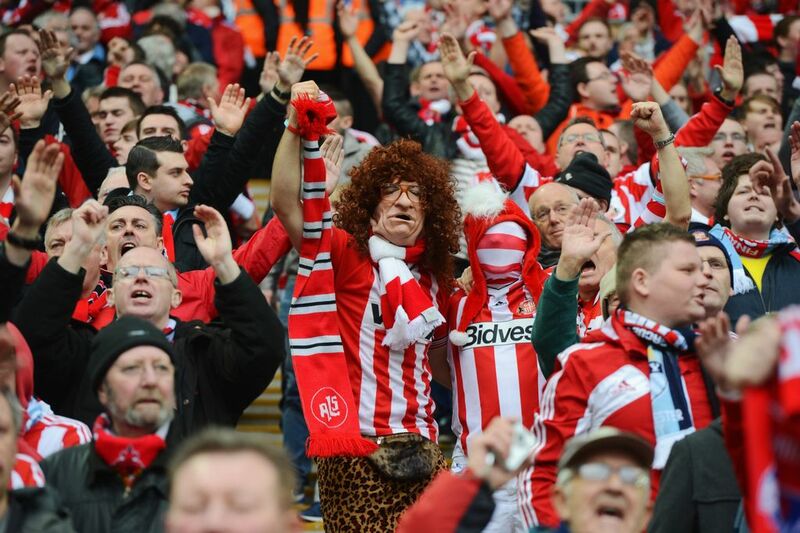 For once in this incredible run, Sunderland could not muster an appropriately spirited response. Limbs wearied, hope ebbed away. A late third as they pressed gave the scoreline an unfair reflection. They left without a trophy but with heads held high.